My kids play the Lego games. I hate them! Wish they would make a proper TFA game. With Star Wars video games, I think it's better to focus on a theme that isn't tied to a particular movie, or one that touches on multiple movies, rather than covering a movie beat-for-beat. We should get some decent games after the next two episodes are made and the "world" of the new trilogy is more established. Then developers can expand upon it with new characters and stories that are better fits for games but still feel authentic. Regarding this one, I'm not sure there's enough material to even make a good-sized game - they usually cover more than one movie. Although they did it for Jurassic World, which I haven't played. Did it seem padded? Lego Jurassic World covered all 4 Jurassic Park movies. The only existing Lego game I can think of that only covers 1 movie is the Lego Movie game. lol... Agreed about a proper TFA game; I'm hoping for something along the lines of Dark Forces. I'm really surprised we only have Battlefront since Disney took over. That doesn't even qualify as a TFA game. Man, I just cant get any enthusiasm for Lego games anymore. I want to. But just cant. Maybe if it was less puzzle and more action like the Lego Movie Game was. That will be the 7th Lego game in a generation of consoles that will be 2 1/2 years old at the time (and that's not counting Lego Dimensions ). They're going to the well way too often and even the biggest fans of their games are getting franchise fatigue by now. Gotta pick and choose. I only played SW: Complete Saga last gen and toiled in Batman 2 this gen before getting hooked on Jurassic World over Christmas with the kiddos. Still have Dimensions unopened though. I was a little surprised that there were 7 already, but sure enough. I've played them all, still can't wait for the return to Star Wars. I think playing with the kids helps keep it fresh for me. I used to love the Lego games, but it peaked with Marvel Super Heroes and has gone down fast since then. That game managed to get rid of a lot of the issues of the previous games, but i have grown very tired of having to replay levels 3-4 times to unlock everything. MY step daughter deleted by accident my MSH save which was something like 99.8% complete and i seriously cannot be bothered going back through it all again to get the characters (which is what i was only interested in by games end). I agree with bringing more new Star Wars games and not just Lego cut and paste games. I mostly lost interest in the Lego games when they became open world. It's Lego, I don't need it to be Far Cry 4; just be linear in nature, throw in some clever puzzles and be charming. I would totally play a Far Cry LEGO game. Hell, even a Halo or Call of Duty. 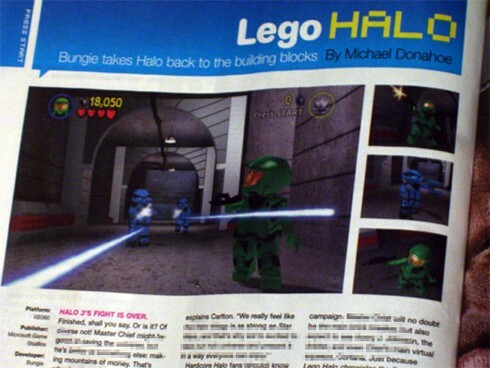 A FPS LEGO game could be pretty cool.